One thing that has become very common, now that the African Traditional religions have become more popular, is the blending of different traditions and the desire to equate spirits from one tradition with the spirits of another. Sometimes this is done by those who don’t know any better, sometimes this is deliberate fraud, sometimes it is a conclusion drawn by those who are just trying to make sense of an unfamiliar set of beliefs. None of that makes it right. Each religion in the African Diaspora has its own set of rules and its own set of spirits, and they are quite separate. While there may be some similarities between them, these spirits and traditions cannot be merged into one another. And nor should they be. There are many different African Traditional religions, ranging from those still found in Africa (such as Beninois Vodoun and Ifa) and those which have emerged in the New World (Haitian Vodou, Santeria/Lukumi, the different forms of Palo, Candomble, Qimbanda, Umbanda, 21 Divisiones etc.) Some are more similar than others, due to geographic proximity and the shared origins of the slave population which was brought to those areas from Africa. Others are very different, and for similar reasons. New World traditions also incorporate some of the beliefs and practices of the subjugated native populations, creating further differences between the different traditions. While the religious paths of Africa and the African Diaspora may be practiced side by side by the same practitioner, they are never mixed. Someone who practices both Santeria/Lukumi and Haitian Vodou, for example, will not place their Orisha upon their Vodou altar. They will not draw veve for their Orisha, and they will not make elekes for their lwa or keep their lwa inside sopera. They will practice Santeria/Lukumi according to La Regla Ocha, and Haitian Vodou according to the reglemen of that religion. They will keep them separate, as they are two vastly different forms of religious practice. While they may have originated on the same continent, Africa is a large continent that was home to many nations. The spiritual practices of the Yoruba people are very different to those of the Fon people. Additionally, the Yoruba nation in particular was very large, and within itself was home to a number of different traditions. While Santeria/Lukumi evolved directly from Yoruban practices, other paths, such as Haitian Vodou, drew from the many different practices of its very diverse slave population. While some people claim that it is okay to mix traditions from the African Diaspora because they ‘would have mixed in Africa’, this is incorrect. If two different nations had contact, it was not likely to be peaceful contact in which they shared their beliefs. Instead, it was more likely that one nation would battle to enslave members of the other to sell to white slave traders. There are also those who claim that it is okay to mix traditions because they were mixed in places like Haiti. Those people fail to take into account that the slave population of Haiti were forced to adapt and merge their beliefs due to their dire circumstances. It was a matter of the survival of their spiritual practices, and they were merged in a way which maintains a strict system of rules governing how those spirits are served. Also, Vodou is practiced very differently in different parts of Haiti. 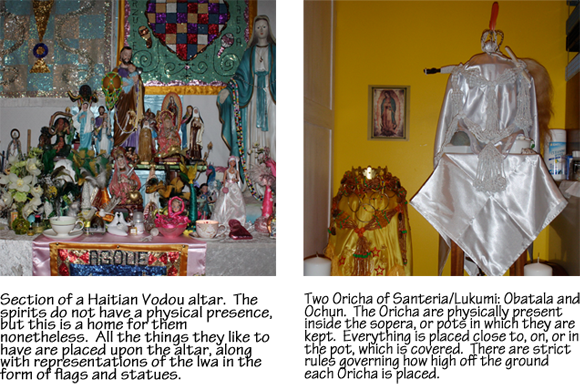 The way Vodou is practiced varies from house to house, society to society and location to location. One thing all practitioners agree on, however, is that Vodou is service to the lwa and adherence to the reglemen (rules) which govern their practice. Haitian Vodou is Haitian, the lwa are Haitian, and the way in which the lwa are served is unique to Haiti and its culture. Santeria/Lukumi is Cuban, Candomble is Brazilian, as is Qimbanda. While some of the spirits of these traditions share some similarities, the lwa are not served in Qimbanda, the Orisha are not served in Vodou, and each path served its own spirits in its own way. A good example is that of Yemaya and La Sirene. Firstly, La Sirene is not Yemaya. La Sirene is a spirit who originates with the Kongo people, and who is served in Haitian Vodou. She is and has always been an ocean deity, a mermaid. Yemaya is also a mermaid spirit, but she originates with the Yoruba people. She was originally a river spirit, but evolved when she came to the Cuba to suit the needs of her people and her new environment. These are two spirits who originate with two different African nations. They may have some similarities, but they are served in two very different ways and cannot be equated with one another. Someone looking at the spirits of the African Diaspora from a Jungian perspective, or someone who looks for archetypes, would look at the form, function and accoutrements of these spirits and say that because they fit the same archetypal pattern, they are the same. However, one cannot look at African Traditional Religions from this perspective. The spirits served in these traditions are ancestral. This is important to remember. It is completely alien for someone of Santeria/Lukumi to serve Papa Legba, because Legba is of Fon origin. Papa Legba may have some similar functions to Eleggua, but they are not the same spirit. The Santeria/Lukumi tradition is Yoruban in origin, so that path serves the ancestral spirits of the Yoruban people. Haitian Vodou is the service of the ancestral spirits of the diverse peoples of Haiti, both African, native Taino and those that are uniquely Haitian. 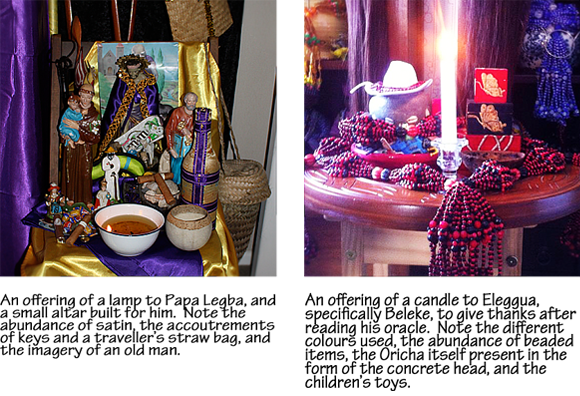 Santeria/Lukumi is the service of the ancestral spirits, the Orisha of the Yoruban people as practiced in Cuba. Candomble is the service of the Orixa as practiced in Brazil, but differs from Santeria/Lukumi due to geography and differing representations of the priesthoods of each Orixa to that of the Cuban slave population. Palo is the service of the ancestral spirits of the Kongo, and Qimbanda also has its origins there. The key is ancestry. People who try to merge the Legba of Haitian Vodou with the Eleggua of Santeria/Lukumi and the Exu of Qimbanda are ignoring this simple fact. Yes, these spirits hold some similar functions, but they originate in very different places. Kongo, Fon and Yoruba practices differ greatly from one another. The ancestor spirit of one of these people is not the same as the ancestor spirit of another, particularly as it is unlikely that those African nations had peaceful relationships with one another. While each path has elements in common, the spirits they serve and the way they serve those spirits are very different. There is one thing, however, that each African Traditional path has in common: the emphasis on the guidance of the priesthood and the adherence to the rules that govern the service of the spirits. It is important, no matter which path you are called to follow, that the advice of a priest or priestess of that path is sought. Community is important. The passing down of correct knowledge is important. Doing things right is important. You can no more mix the African traditional religions with one another than you can mix them with ancient Greek or Roman practice, or Wicca, or any other faith. Each is a separate path with its own spirits and its own rules, and should be respected and followed as such.